Upon discovering she carries the # 1 gene for Alzheimer's disease, 80-something veteran CNN journalist Jean Carper embarks on a daring journey to face her worst fears and discover all she can about the condition. Including volunteering herself as a guinea pig for high-tech testing, she examines the irrational fear, drug failures, dangerous misconceptions, and hidden facts about Alzheimer's disease. Told with surprising humor and creativity, Carper finds things are maybe not as dire as the media makes them out to be. Jean Carper was CNN's first medical correspondent and winner of a prestigious Ace Award for a series on brain cancer. She is the author of twenty-four books, including "New York Times" bestsellers "Stop Aging Now!" and Food Your Miracle Medicine", as well as a former columnist for Gannett's "USA Weekend", with a readership of 50 million. 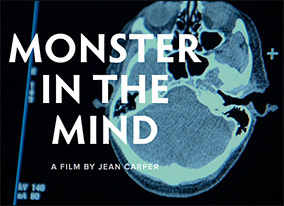 Now, at age 84, "Monster in the Mind" is her first feature documentary.